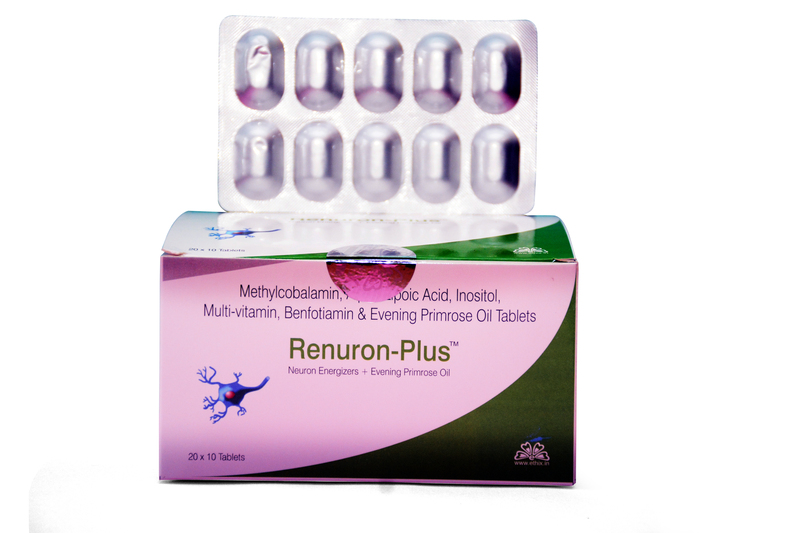 Description: ReNuron-plus is completely giving nutrients to the body. It prevent anemia for both adult and children. It will reduce nausea and vomiting during pregnancy and increased immunity. It will give enough folic acid during pregnancy so birth defect of baby can be prevented. What is mean by mecobalamine in ReNuron-plus? Vitamin B12 is the common name for a nutrient known scientifically as mecobalamin. It’s used as a supplement and to treat certain anemia. 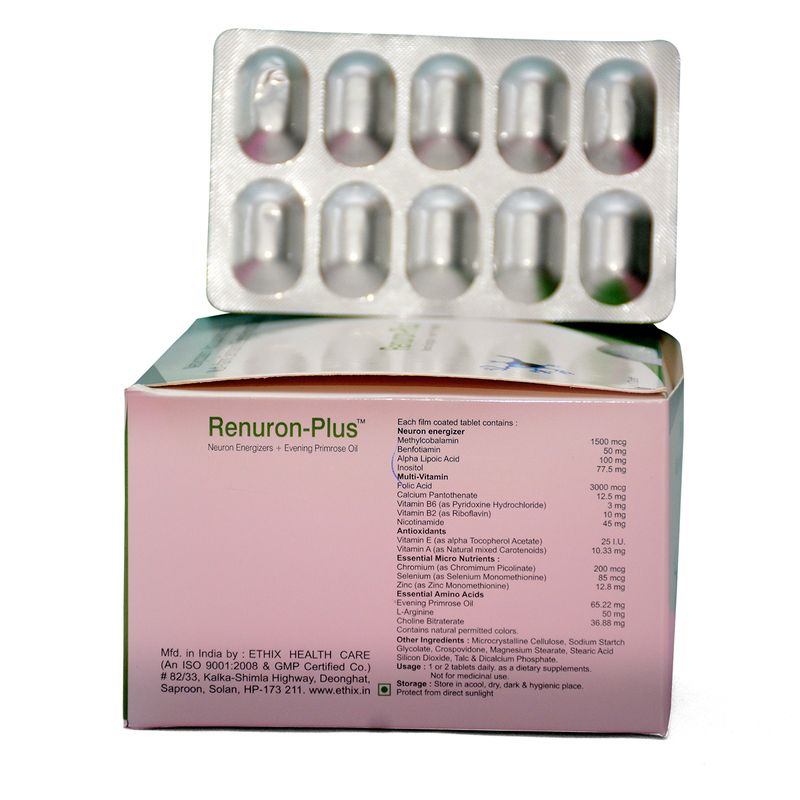 ReNuron-plus with Vitamin B12 plays an important role in helping body make red blood cells. What are Mecobalamin in ReNuron-plus used for? ReNuron-plus with Mecobalamin is a naturally occurring and pure form of Vitamin B12. It is taken to regulate certain vital bodily functions like cell multiplication, blood formation, and protein synthesis. This supplement is used to treat Vitamin B12 deficiency in people with Pernicious Anemia. What are the benefits of taking ReNuron-plus in folic acid? ReNuron-plus Folic acid acts by helping the body produce and maintain new cells. In particular, red blood cell formation is dependent upon adequate levels of this vitamin. Folic acid deficiency is a known cause of anemia in both adults and children. What does ReNuron-plus with folic acid do for a woman? ReNuron-plus with Folic acid is a B vitamin. If a woman has enough folic acid in her body before she is pregnant, it can help prevent major birth defects of her baby’s brain and spine. These birth defects are neural tube defects. Women need to take folic acid every day, starting before they are pregnant to help prevent NTDs. What does vitamin b6 in ReNuron-plus do? ReNuron-plus with Vitamin B6 is also needed for proper brain development (in kids) and function (for people of all ages). It helps the body make the hormones serotonin (which regulates mood) and nor epinephrine (which helps your body cope with stress). What are the benefits of taking ReNuron-plus with vitamin b6? High doses of ReNuron-plus with B6 have been used to prevent or treat certain health conditions, including PMS, age-related macular degeneration (AMD) and nausea and vomiting during pregnancy. What are the side effects of taking b6? Sensitivity to sunlight. More details.. When should I take ReNuron-plus with folic acid morning or night? Take folic acid at the same time each day, either in the morning OR in the evening. Take your folic acid tablets with a glass of water. What are the benefits of ReNuron-plus with alpha linolenic acid? Why alpha linolenic acid in ReNuron-plus is important? Alpha-linolenic acid in ReNuron-plus is popular for preventing and treating diseases of the heart and blood vessels. People can use ReNuron-plus alpha-linolenic acid to prevent cancer. Does ReNuron-plus with linolenic acid reduce inflammation? This ReNuron-plus supplementation strategy successfully maintains the anti-inflammatory capacity of GLA and increases serum EPA, without causing accumulation of arachidonic acid. Flaxseed oil is a concentrated source of omega-3 alpha linolenic acid. What is Vitamin E in ReNuron-plus for? Vitamins are needed for growth and good health. Vitamin E in ReNuron-plus is thought to protect the body from the harmful effects of a chemical reaction known as oxidation. Vitamin E in ReNuron-plus is important for many processes in the body. It is naturally found in foods such as vegetable oils, meat, eggs, milk, and leafy vegetables. Vitamin E in ReNuron-plus is prescribed to treat a deficient state or as a supplement. It is also prescribed in certain other conditions like cystic fibrosis and abetalipoproteinaemia. How does Vitamin E in ReNuron-plus work? Vitamin E in ReNuron-plus is a diet aid that helps the body with muscle and nerve function. Vitamins work best when given with a well-balanced diet. See More..
How Vitamin E in ReNuron-plus be used? To gain the most benefit, take the medicine daily or as prescribed by your doctor. Take with or without food. Take with food if it causes an upset stomach. Swallow the capsules whole, do not crush, chew or open them. Liquid – Shake well before use and measure the liquid with the dropper or cup provided. Feeling tired or weak (fatigue), stomach pain, loose stools (diarrhea), headache, nausea, or blurred vision. See more..
Topcare is a special nutritional formulation which helps to prevents all kind of hair problems and also treat skin problems. Hair-specific nutrients can help for healthy hair growth, prevent pediculosis and dandruff and promote thickness of hair. It prevents the breakdown of hair and hair loss. Enzovit with Pepsin is an endopeptidase that breaks down proteins into smaller peptides (that is, a protease). Pepsin is produced in the stomach and is one of the main digestive enzymes in the digestive systems of humans and many other animals, where it helps digest the proteins in food. Ironext drops used for the treatment for anemia and give nutritional supplements to the body. It improves immunity, promotes hair growth, prevents tiredness and fatigue. Cyclospas used to treat pain (including headache, toothache, back, and period pain) and cold or flu symptoms. Dicyclomine in Cyclospas is used to treat a certain type of intestinal problem called irritable bowel syndrome. It helps to reduce the symptoms of stomach and intestinal cramping.